The following routes will be adjusted effective Saturday, December 8th, 2018. Where applicable, new schedules for Weekday, Saturday and Sunday/Holiday service have been created to accommodate these changes. Trip time adjustments have been made to improve schedule adherence . Trip time adjustments have been made to improve schedule adherence. The route will be renamed 58 - Hollywood Road / Lucile Avenue. Trip time adjustments have been made to improve schedule adherence. The route will be renamed 85 – Roswell. Trip time adjustments have been made to improve schedule adherence. In addition, weekend service has been extended to North Springs Station. As a result, the weekend bus stop at Northridge Road & Colquitt Road will be discontinued. 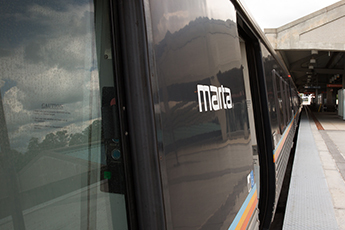 The route will be renamed 87 – Roswell Road / Sandy Springs. A second pattern has been added to serve Riverdale. From Old National Highway, alternating trips will now operate via Jonesboro Road (GA 138), GA 85, Church Street, Bethsaida Road and Lamar Hutcheson Parkway to the Xpress Riverdale Park & Ride. Riverdale trips will return inbound via Lamar Hutcheson Parkway, Valley Hill Road, GA 85, Bethsaida Road, Church Street, GA 85 and Jonesboro Road (GA 138) to Old National Highway. Routing for trips serving Union City will not be affected. The route will be renamed 89 – Old National Highway. An earlier weekday trip has been added to arrive at Kensington Station at 4:50 AM. In addition, trip time adjustments have been made to improve schedule adherence. Service has been adjusted to always operate at 30-minute frequency, seven days a week. In addition, 15-minute service will be provided in the peak direction (morning peak period trips inbound to Avondale Station; afternoon peak period trips outbound to Panola Road) on weekdays. Select midday trips will continue to serve the Lou Walker Senior Center. Trip time adjustments have been made to improve schedule adherence. The route will be renamed 125 – Clarkston. Service frequency has been adjusted to operate every 10 minutes during the morning and afternoon peak periods. Trip time adjustments have been made to improve schedule adherence. In addition, all weekday peak period trips will serve Jett Ferry Road. The route will be renamed 150 - Dunwoody Village. An earlier weekday trip has been added to arrive at Lakewood Station at 5:25 AM. In addition, inbound trips will no longer pull in to the Xpress Riverdale Park & Ride. Instead, the facility will be served by a stop on Lamar Hutcheson Parkway. Outbound trips will no longer pull in to the Xpress Riverdale Park & Ride. Instead, the facility will be served by a stop on Lamar Hutcheson Parkway. Trip time adjustments have been made to minimize conflicts at Georgia State and West Lake Stations. The route will be renamed 813 - Atlanta University Center. Trip time adjustments have been made to minimize conflicts at West Lake Station.